Growing up, Passover meant sweet and sour brisket. Slowly braised in the oven for hours until Bubbe declared it was tender enough to eat. Sounds simple enough, but that poor brisket was in and out of the oven and examined and re-examined until it was dry. So we tried chicken one year. Surely that would fare better. But the story was the same- Bubbe, my Mom and Aunts gathered around the oven trying to determine if the chicken was done. Opening and closing the door, all whilst poking and prodding the poor bird. “Is it done?” “It looks done.” “No I see pink!” They were petrified of giving the whole family salmonella. Sigh. Passover recipes are actually some of my favorite to develop- the limit in ingredients forces me to get creative and put together recipes that I never would otherwise. 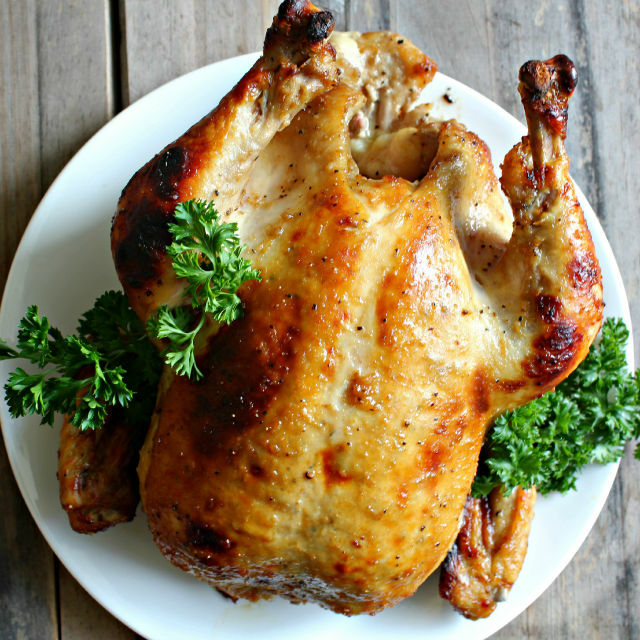 I decided to make a roasted chicken as homage to that Pesach–it would work for a seder, or you could nosh on it for meals during the chametz free week. Honey and mustard is one of my favorite combos, but of course mustard is out. How about horseradish instead as a nod to the seder meal? The horseradish gives the chicken a subtle spiciness much like a Dijon would, and is balanced with the sweet honey–delicious! Stuff chicken with the lemon garlic, onion and rosemary sprigs. Truss the chicken, or tuck the wings under the body and tie together the legs. Let chicken rest for 20 minutes covered with aluminum foil before carving. Garnish with parsley if desired. Skip the traditional and try this Italian style chopped liver for a rich, sweet, and flavorful spread.